2 magic days in Los Angeles with a private friendly guide. Explore Los Angeles with an insider on this fun walking tour to cover all the most prominent places and neighborhoods from Walt Disney Hall, Los Angeles City Hall and Union Station to Rodeo Drive, Walk of Fame and Hollywood Boulevard. See the city of eternal summer where you can expect to see a celebrity around the corner. Immerse yourself in the melting pot of rich history, diverse culture, unique architecture and hipster coffee shops. Witness the world’s shortest railway built in 1901 - Angel’s Flight Railway, and take a selfie with the funicular from the awe-inspiring angle. Sample artisan coffee blends at historic landmark - Grand Central Market (optional, not included). Get advice and recommendations from your guide about what else to see on your own, after all LA has one of the largest number of museums per capita. Have fun on the this private 2-day Los Angeles tour (5 hours each day). Get an insider’s glance of Tinseltown, take in the astonishing vistas, incredible architecture and unmatched dining options. Timing is flexible and you can start the tour any time you prefer. This tour can be customized to make it a unique experience for you. 10.00am Meet your guide in the hotel lobby. Get back in time at Union Station and enjoy Art Deco. Visit El Pueblo – the birth place of Los Angeles. Get spectacular vistas of the town from the observation deck of Los Angeles City Hall with a great 360-degree view of the city. Roam along the bright green oasis in Grand Park, perfect place for photo ops. See the magnificent Walt Disney Concert Hall which has instantly become one of the most recognizable landmarks of LA. 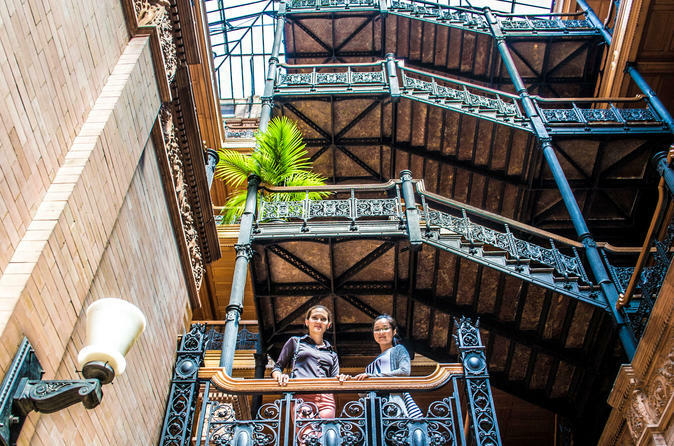 See Bradbury Building - the most photographed building in LA and the film location for so many movies. 1pm Time for lunch at Grand Central Market! Obtain gastronomic satisfaction and try local organic delicacies (your own expense). Witness the world’s shortest railway Angel’s Flight Railway built in 1901. Learn about the Los Angeles Central Library, an architectural gem that combines ancient Egyptian style with elements of Art Deco. Grab some coffee with your friendly local guide at Pershing Square, enjoy a casual chat and observe the Los Angeles skyline with the iconic architecture like the Biltmore Hotel. Immerse yourself in the hustle of the most vigorous area in Downtown - Financial district. See the historic theaters on Broadway Theater District built in 1910 – 1931. Head to the futuristic Staples Center and LA Live, home to the voguish Microsoft Theatre, Regal Cinemas and finest restaurants and bars. 3pm Finish your tour at LA Live to grab a snack, see a movie or explore more of downtown LA. Or else head back to the hotel if it’s located nearby. 10am Have fun window-shopping on Rodeo Drive and keep your eyes open – this is the place where celebrities hang out every day. 12pm Check how the crown jewel of mall shopping in LA - The Grove - looks like and have lunch at Farmer’s Market, so popular among locals. Take a historic walk on the Sunset Strip and learn about the history of the legendary Sunset Strip and the American cinema. 2pm See the elegant Dolby and Graumann’s Chinese Theaters on Hollywood Boulevard, and the busiest tourist attraction in the City of Angels - Hollywood Walk of Fame. Don’t get lost! 3pm Finish the tour at Ghirardelli Chocolate shop and indulge in world-class shopping, dining and views.